Take your java to the dark side! Gallery-wrapped "vintage ad" art from Steve Thomas. Canvas print measures 17-inches tall x 12 3/4-inches wide. Hand-numbered limited edition of just 495 pieces! 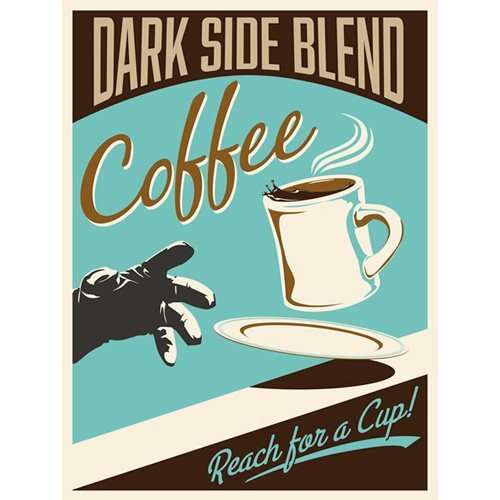 If you haven't tried Darth Vader's special "Dark Side Blend" of coffee, it's time for you to "Reach for a Cup!" like it says on this Star Wars Dark Side Blend by Steve Thomas Gallery-Wrapped Canvas Giclee Art Print. (The "or else" is just implied.) Artist Steve Thomas' immensely popular (and sold out) Star Wars "vintage ad" series is now available as part of Acme Archive's Gem canvas collection! This unframed canvas print comes gallery wrapped around a 1 1/2-inch wooden stretcher bar and is ready to hang on your wall (or give as a gift). It's a hand-numbered limited edition of just 495 pieces that measures 17-inches tall x 12 3/4-inches wide and comes with a certificate of authenticity.